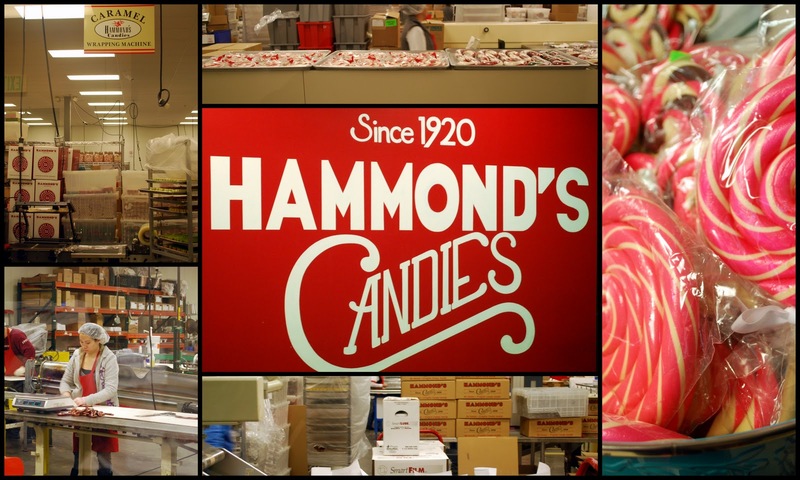 While I was recently in Colorado, visiting my Children and grandchildren before Christmas, we all decided to take a ride to the Hammond Candy Factory located at 5735 North Washington Street, in Denver, Colorado, where we'd go on their free factory tour and watch how they made candy canes, lollypops, and other candies which are basically made the old fashioned way, by hand, since the 1920's. We entered the hospitality center where the free tours run every half hour, Monday-Friday 9:00 am - 3:00 pm and Saturdays 10:00 am - 3:00 pm. They are closed on Sunday. 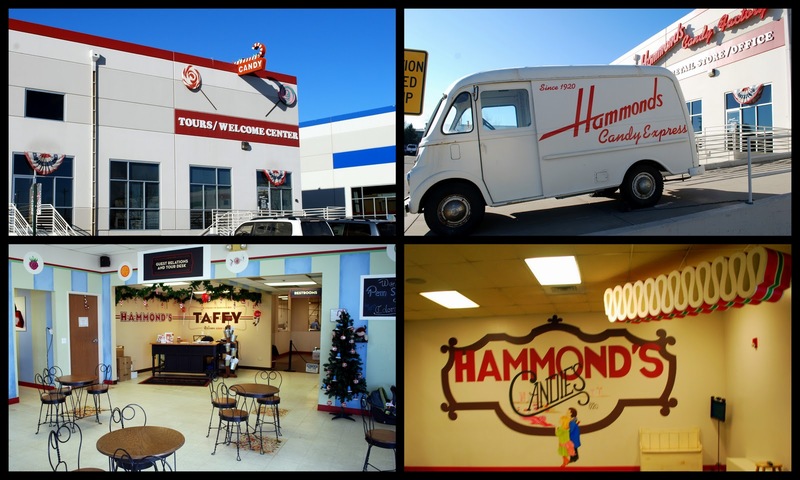 After watching a ten minute video about the history of candy making in Denver, and Hammond's history we were welcomed into the factory to watch the candy making process behind glass windows as the tour guide told us more about what was going on. 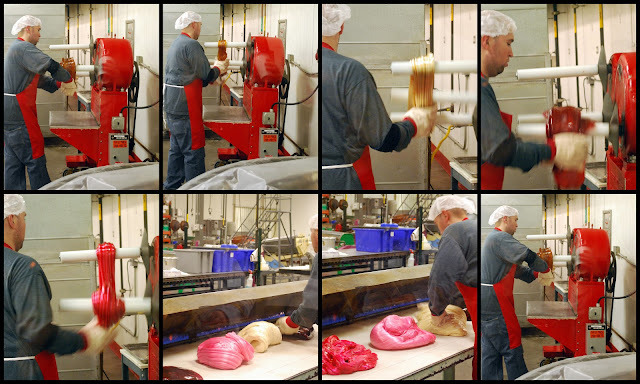 My grandson, as well as the other children on the tour, were enthralled watching candy being made! It is fascinating to watch the syrupy base have color and flavors added. The solid centerpiece is placed on the blanket of stripes, and the blanket is wrapped around it. The candy makers put this roll on a heated canvas mat. The mat is on a machine that rotates the bundle. When the bundle is hot enough, a cook takes one end in his hands and pulls it to the width of a candy cane. As the cook pulls, the machine rolls the bundle. This motion creates the twist in the candy cane stripes. 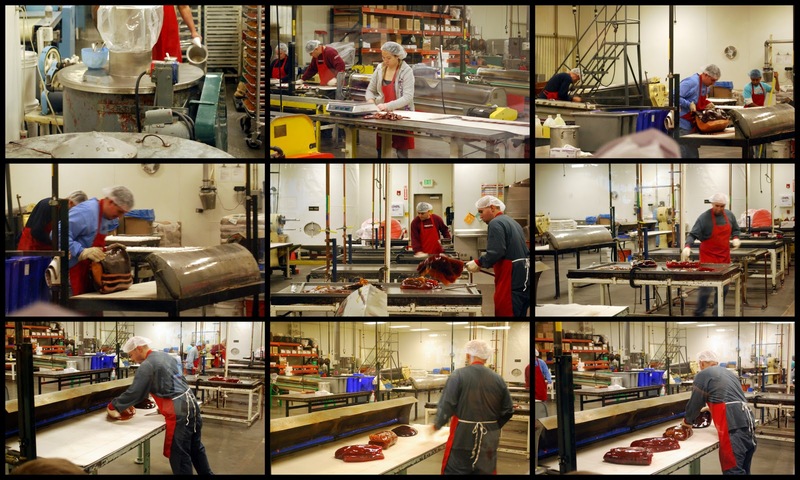 As the cook cuts the strip into pieces, a worker takes each piece and puts a crook in it. 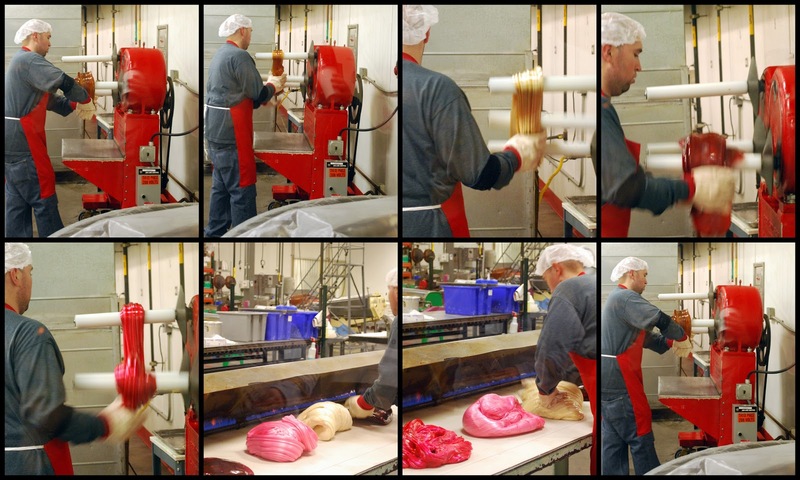 Hammond's is one of the last candy companies to do this part of the candy making process by hand. Workers then place the canes on trays to cool, and then they roll the finished candy canes into the packaging room. The candy canes and lollypops are then wrapped in cellophane, boxed and sent out to stores. There is a wonderful retail store on location that has all the wonderful varieties of colors and flavors, many of which are all natural, of the large seven inch candy canes for sale! We bought Apple Pie, Sugar Plum, Cherry and Chocolate filled Peppermint flavored candy canes. 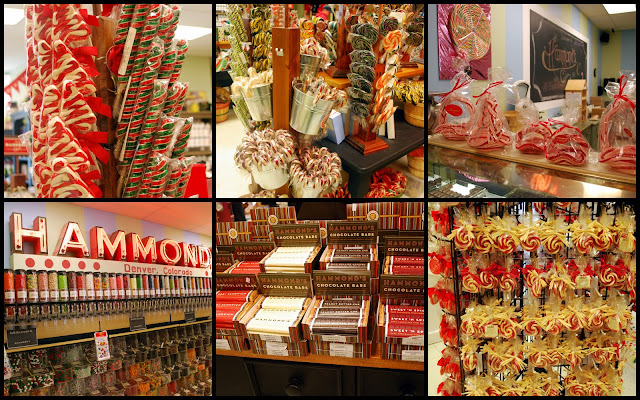 Hammond's also makes old fashioned ribbon candy and sells many gift set assortments. ...candy dips and snacks, cocoa and taffy. 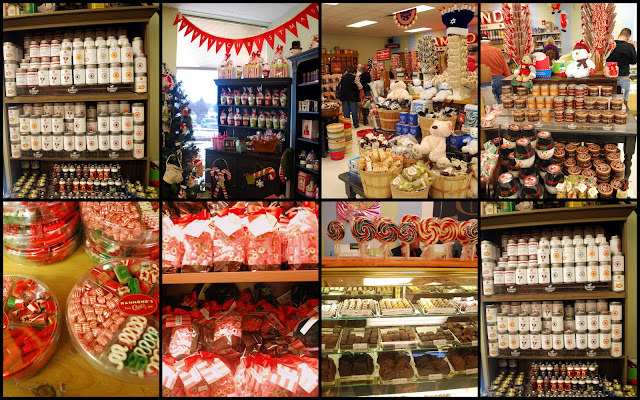 They make special candies for the holidays, so we saw plenty of Christmas and Hanukkah candy on display during our visit. You can also order their candy online. If you really want to impress someone you can even buy this giant five pound lollypop! This was seen in the Food Network Show "Kid in a Candy Shop" episode that was shot at Hammond's. My grandson certainly enjoyed his visit to Hammond's Candy Factory! I'm adding this post to the "Foodie Friday" blog event on Michael's blog Designs By Gollum , and "Pink Saturday on Beverly's blog How Sweet the Sound. Since my husband and I celebrate Christmas in Colorado at both my son and daughter's homes, and here in New York at our home and with my extended family, Christmas really does seem to last 12 days for us, if not more! This week we will be celebrating with friends, so the festivities continue. There will be more good food, good times, and good cheer! I hope you all had a beautiful Christmas, and I look forward to seeing all your celebrations on your blogs. As we look forward to the beginning of 2012, I wish you health, happiness and prosperity in the new year! "And, lo, the angel of the Lord came upon them, and the glory of the Lord shone round about them, and they were afraid. And the angel said unto them, Fear not: for, behold, I bring you good tidings of great joy, which shall be to all people. For unto you is born this day in the city of David a Savior, which is Christ the Lord. And this shall be a sign unto you; Ye shall find the babe wrapped in swaddling clothes, lying in a manger. And suddenly there was with the angel a multitude of the heavenly host praising God, and saying, Glory to God in the highest, and on earth peace, good will toward men." I received the following poem in a Christmas card one year and loved it. I saved the card so that I can read it every year, as it really expressed how I feel. I hope that you will also enjoy reading it! The tighter my throat gets when I sing "Silent Night"
The more I love Christmas!" Wishing everyone a beautiful Christmas! High upon a hill at 400 8th Street and Logan Street in Denver, stands the Colorado Governor's Residence, also called "Colorado's Home." It was built as a private residence in 1908 by one of the state's leading pioneers, Walter Scott Cheesman. He rode an ox cart from Chicago to Denver in 1861, where he joined his brother in the drug store business. Cheesman became an enthusiastic and effective booster of his new city, helping bring railroad service to Denver, developing the town's fledgling real estate industry and helping the city to rise to local and regional prominence. When Mrs. Cheesman died in 1923 the house was sold to Claude K. Boettcher, a leading western businessman. The house was inherited by the Boettcher Foundation when Mrs. Boettcher died in 1958. The foundation offered the house to the State of Colorado as an Executive Residence. The building needed a great deal of work, and its fate remained uncertain for nine months in 1959 as three agencies of the State rejected the offer. On the last day of 1959, Governor Stephen McNichols accepted the building as a gift to the state. The house has been available for use by Governor's since 1960, both as a home and for official Governor's functions. The present Governor, John Hickenlooper, and his First Lady, Helen Thorpe, chose not to live in the house during his term, as their young son did not want to leave his neighborhood friends, but the house is still used for Colorado governmental functions. The 24,000 square foot mansion has housed six governors since 1960 and a handful of royalty and world leaders, including Charles Lindbergh, Dwight D. Eisenhower, Harry Truman and Princess Anne. ....mini Christmas trees decorated with white snowflakes, glass icicles and white and gold Victorian style ornaments stand on top of a hand carved Italian baroque credenza dating from the 16th century, behind the trees hangs a 1740 Beauvais tapestry, one of the several rare tapestries that decorate the mansion. Every room on the first floor of the residence was decorated with a Christmas tree. The Drawing Room's tree had a Victorian theme, including Victorian-era toys surrounding the base of the tree. The piano in the room is a Steinway. The Drawing Room's mixture of European and Oriental motifs is carried throughout the mansion's public rooms, a reflection of the eclectic tastes of its private owners. Of particular note in the Drawing Room is this magnificent Waterford Crystal Chandelier that once hung in the White House ballroom in 1876, when President Ulysses S. Grant presided over America's centennial celebration and which was the year Colorado was admitted into the Union as a state. The beautiful library was remodeled in 1927 by the Boettcher family, with intricate cross-cut inlaid oak paneling covering the walls. According to the Governor's residence website: "A centerpiece of the Library, and of the mansion, is the Louis XIV French cylinder desk, made of rare and delicate tulip wood with massive ormolu mounts. Created by Andre Boule, the most celebrated of Louis XIV furniture makers and designers, it is said to be one of only two in existence. The Library also boasts four circa 1690 armchairs, one of Aubusson tapestry, and a glass display case that holds unique jade sculptures from the 16th and 17th centuries, a pair of four-foot tall Chinese cloisonne urns, remarkable for their size and azure color and four Tang mortuary horses." The beautiful custom made area rug in the library depicts Colorado wildflowers. In the State Dining Room, the table and throne-like chairs are from Italy, hand carved from walnut. The massive table features lion and shield supports. Flanking the fireplace are antique French rococo style mirrors atop console tables. Over the table hangs an 18th-century French bronze and crystal chandelier, with fruit shaped pendants in amethyst. The magnificent Palm Room and its two wings have floors made of white Colorado Yule marble, the same marble that the Tomb of the Unknown Soldier in Washington, DC is made from. Italian Carrara marble was used for statuary, the scrolled pedestal tables, and benches and urns. In the wings of the Palm Room, there is hand-crafted floor to ceiling leaded glass windows which bear the Boettcher family initials and overlook the south lawn. The room was very bright from the morning sun, so it was hard to photograph the Palm Room's Christmas tree, but if you look closely you can see it is decorated with Native American themed ornaments. On a clear day Pike's Peak, which 70 miles to the south, can be seen in the distance. Colorado's First Lady Helen Thorpe wanted to include a multicultural theme to this years holiday decorations, so there were displays in the rooms and in the main corridor of artifacts significant to holiday and winter celebrations of the different ethnic groups that contributed to Colorado's heritage throughout its history. 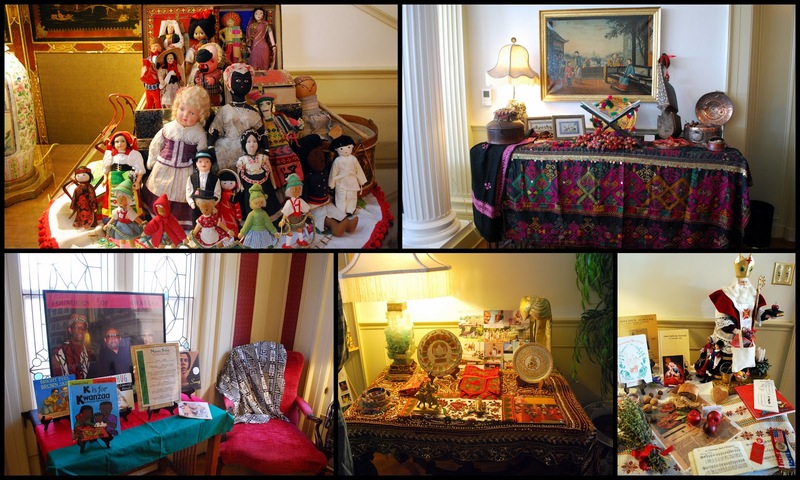 The holiday decorations are from Asian, African, European, Native American, Latin American and other cultures, and a complete list of the cultural heritages displayed, and their contributors, can be read on the Governor's website. ...was a beautiful folkloric diorama of Mary and Joseph on their journey to Bethlehem before the birth of Christ. 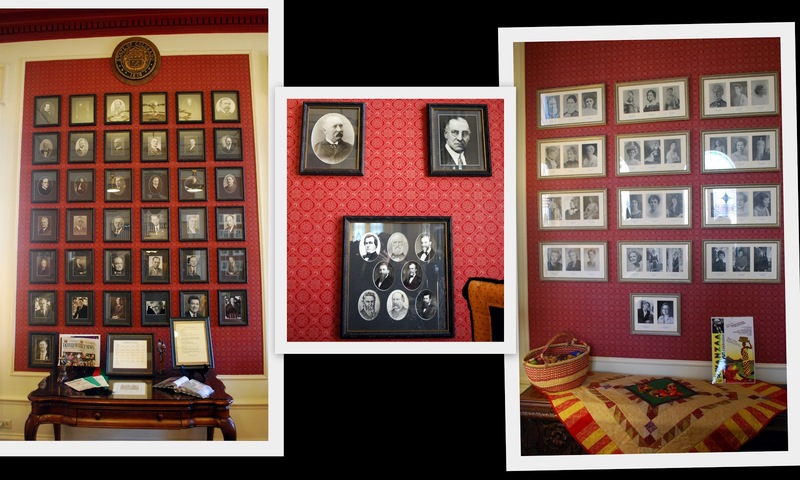 The Governor's residence family room was decorated with a Kwanzaa theme. This was the family room's beautiful entertainment bar. The family room also contains photographs of all of Colorado's past and present Governors, which can be seen on the left side of the photo collage above, and former and present First Ladies, which are on the right, and also portraits of the pre-statehood Territorial Governors, which are located in the middle. The second and third floors of the residence are the private quarters of the first family. According to the Governor's residence web site: "The second floor contains the elegant Guest Suite that is a showpiece of the mansion's historic grandeur. After a 1987 remodeling, the three-room suite was outfitted with a set of unusual painted-finish Venetian furniture pieces that were in storage since the 1920's. These Venetian pieces include twin sleigh beds, armoire, desk, and chandelier. This was the room known as 'Charlie's Room' during the Boettcher years, as Charles Lindbergh was a close friend of the Boettchers' son, and was such a frequent visitor." I really enjoyed my visit and tour of this stately mansion! The mansion's grounds are in keeping with the classical decor of the marble Palm Room. Architectural elements include a small columned stone garden temple with a wrought iron dome. There is a wide Italianate balustrade around the upper terrace and an alcove below with stone benches. The residences' original carriage house has been renovated as an event space, and the week I visited Denver there was daily holiday entertainment being hosted in the carriage house. I was fortunate that on the day of my visit there was a wonderful music program about the customs of a traditional Irish Christmas, along with hot apple cider being served as refreshment. It was presented by the Colorado Governor's Residence Preservation Fund (GRPF). The GRPF is a Colorado not-for-profit corporation whose mission is to preserve the Residence in perpetuity and to provide educational and cultural programs from the Residence that are statewide, inclusive, and nonpartisan. If you visit Denver try to schedule a visit to tour the Colorado Governor's Residence, as I think you will find it as interesting and beautiful as I did! 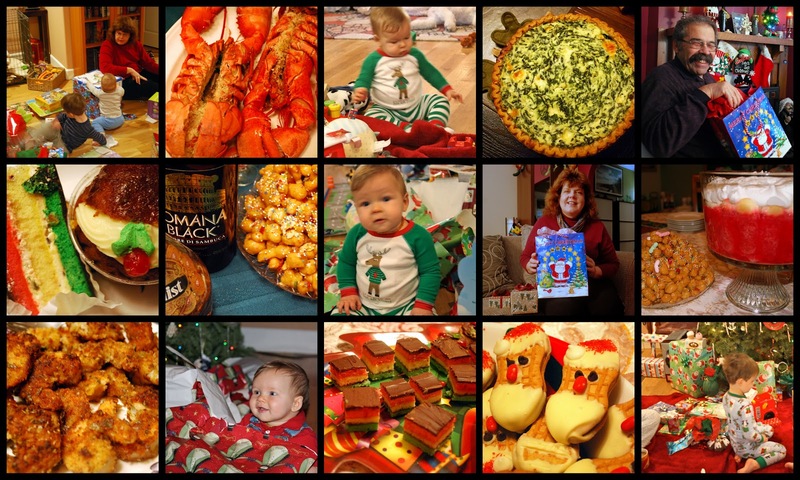 I'm linking this post to the following blog events: Outdoor Wednesday, Alphabe Thursday (the theme is anything holiday), Tablescape Thursday, Show and Tell Friday, and Pink Saturday. Thank you to all the blog hosts! New York City Is Getting Ready For Christmas!